Sometimes, you want to disappear. Get off the grid. Disperse. And by disperse, we mean travel to an exclusive island hideaway 10 minutes from Miami Beach. Allow us to direct your attention to the Fisher Island Club and its swanky new beach club and villas, ready to welcome you with about $60 million of recent renovations. If you've ever wondered how Oprah lives on the weekends, this is how. The tony enclave (at one time the wealthiest ZIP code in America) is limited to residents, their guests and hotel guests. And the only way you can enter the island is via helicopter, yacht or the 24-hour ferry. Which means you've probably been here for one of former resident Boris Becker's legendary blowouts... but haven't been back since the redo. To get here, you'll first drive your car onto the ferry for the seven-minute ride across the bay. Then, while sipping your welcome glass of Perrier-Jouët champagne at check-in, you'll toss your keys to the valet and pick up keys to your own golf cart (each hotel room comes with one). 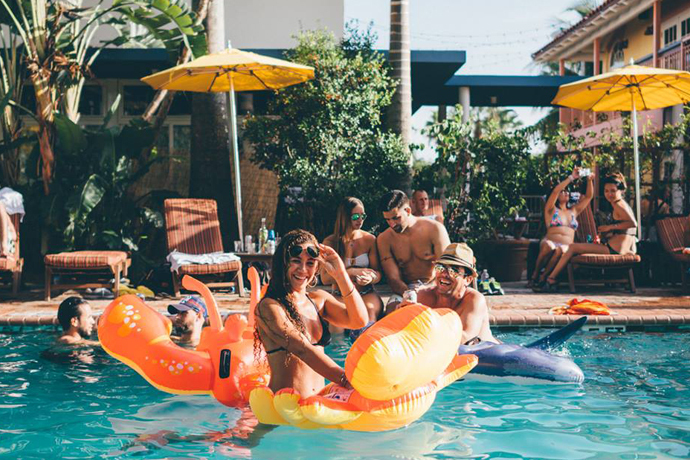 There's plenty to do while you're here—play the nine-hole golf course, tinker with your backhand on the grass and clay tennis courts or take in the unobstructed views of downtown Miami (poolside, of course). But you and your islandmate will probably spend most of your time in one of the renovated villa bungalows, a small cottage with its own secluded back patio and hot tub.